Hello music video friends! It’s Andy Gesner and the staff from HIP Video Promo, here to share a clip made by two of the most storied figures in alternative music history. Greg Dulli and Mark Lanegan have walked parallel paths: both first came to national recognition as the frontmen for ferocious indie rock bands, and have since explored more sedate (though no less dark) territory in critically-respected solo projects. And while grunge and alt-rock fans loved them both, Afghan Whigs and Screaming Trees boldly stood outside the conventions of the times. Lanegan’s Screaming Trees were overtly psychedelic and often mind-altering, while Dulli’s work for the Whigs featured dense, literary and hallucinatory lyricism, and incorporated elements from classic soul and R&B. Since the dissolution of the Afghan Whigs, Greg Dulli has devoted himself to the brooding, conceptually-rich Twilight Singers project; Mark Lanegan’s post-Trees resume includes time spent as a singer for Queens Of The Stone Age, an enthusiastically-received collaboration with Isobel Campbell of Belle & Sebastian, and several magnificently bleak projects of his own. Lanegan also contributed vocals to Blackberry Belle, the grim and gorgeous 2003 Twilight Singers album; Dulli returned the favor with a guest appearance on Lanegan’s Bubblegum. 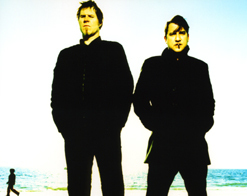 Dulli and Lanegan had known and respected each other for years – and after the aesthetic successes of Blackberry Belle, they immediately began work on the songs that have become Saturnalia. The Gutter Twins is their band together, and it’s as dark, troubling, and irresistible as anything they’ve ever been associated with. Arguably, these two necromancers have amplified and intensified each other’s magic. On Saturnalia, Dulli’s barbed-wire guitar and Lanegan’s whiskey-soaked baritone feel like twin sides of the same blade – and, as always, the lyricism is desperate, honest, human, and impossible to dismiss. “These are songs drawn from the Gothic tradition,” raves Marisa Brown in her All-Music Guide review, “where good and evil and pleasure and pain crisscross and entwine indelibly, where the secular and the sacred have no clear defining lines.” “All Misery/Flowers”, the lead single, is a junkie’s desperate refrain – the killer drug is never made clear, but it could be anything from heroin to religion to love. Throughout, Lanegan sounds on the verge of a breakdown – steeling himself against deterioration, as if the power of his own voice is the only thing that’s keeping him from falling to pieces. “I tell you my story so that you might save me”, he sings, right at the harrowing end; there’s no indication whether the lover addressed – or the Lord above – thinks he’s anything other than a street-crazy. Hula-hoop girls, gold-lame stage-curtains, and Big Easy marching bands don’t impart much levity to the engrossing video for “All Misery/Flowers”. Instead, they add to the feeling of decadence and sleaze that pervades the compelling clip. Lanegan’s camera-presence is remarkable: although he appears to be in a trance throughout his performance, he still commands the lens. Meanwhile, Dulli is a ghostly figure on the piano, cool and detached behind his shades. Together, they walk past the mausoleums of a New Orleans cemetery; in their wake, a stage-dancer twists between the tombstones. Images of the singers blur, float, and slide through the frames; often, their partially-transparent faces are superimposed over shots of flames, dancing girls, microphones, musical instruments. A setting sun cuts between low houses; Dulli and Lanegan stride across an iron bridge. The entire clip is bathed in red light – and devilish illumination seems to radiate from the faces of the two legends as they sing. As always, it is a terrific opportunity for us to work together with Lacey Swain, Megan Jasper, and the entire Sub Pop crew to bring you this dynamic new video. We have lots of copies of Saturnalia for your on-air giveaway needs, not to mention a ton of cool stuff celebrating Sub Pop’s 20th anniversary, so drop us a line to get your hands on some! If you need more info, call Andy Gesner at 732-613-1779 or e-mail us at HIPVideo@aol.com. You can also visit www.SubPop.com, orwww.TheGutterTwins.com to find out more about The Gutter Twins.